1) Take the 1' length of leather cording and fold in half. Make an overhand loop with both sides of the leather cord and the end of the length of nymo cording about 1 1/4 down from the center of the folded cording, leaving a loop that will be large enough to fit over the twist bead that will be attached to the other end of the bracelet. Pull this loop tight and secure the spot where the nymo cording goes in and out of the overhand knot with small dabs of glue. Allow to dry and then secure the nymo cording to just one of the leather cord lengths with another overhand knot. Place another very small dab of glue onto this knot too. Try to keep the glue just on the knot itself and not on the leather cord. The nymo may still swirl around the leather cording as you're beading on the czech beads, but that's okay. 2) The easiest way that we found to keep the leather cording tight as you're threading the beads on is to get some heavy tape and secure the loop end of the leather cording to a heavy table or countertop. Hold the leather tails with your knees, or hold with a large binder clip and secure that with your knees. Work a bit with this and go with what works best for you. If this does involve using your knees to hold tight on the leather cord, make sure to take breaks often. 3) Note what side of the leather cord that the nymo thread is knotted to. Take the cord and go under the other leather cord side, threading on a czech bead in the process. 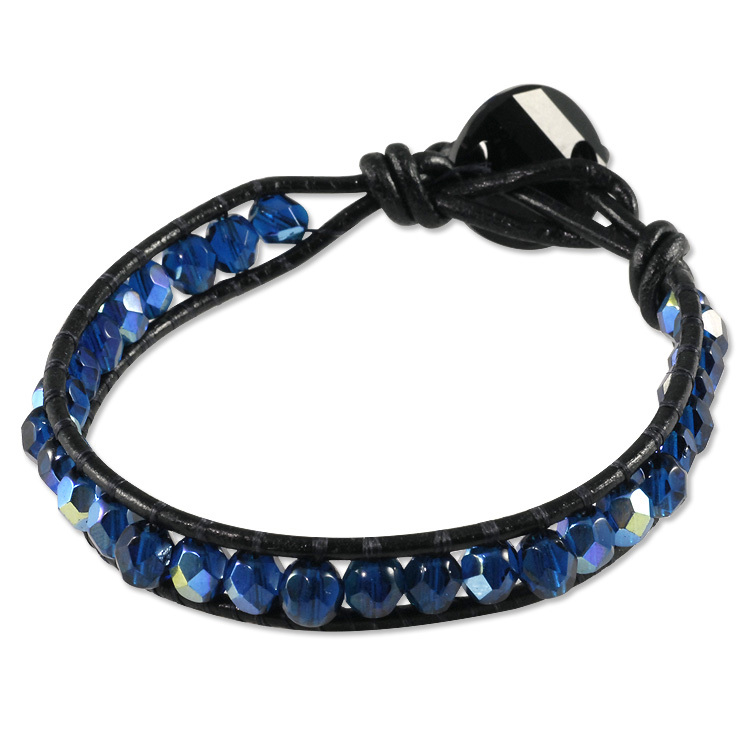 Bring the leather cord up and over the front side of this other side of the leather cording, and then go through the czech bead again so that your nymo thread is back on the side of the bracelet that you started from. Loop the nymo thread around this side of the bracelet and then go under the other leather cord side, threading a czech bead on in the process. Bring the leather cord up and over the front side of this other side of the leather cording, and then go through the czech bead again. Continue this step over and over again, keeping the nymo tight between both of the leather cording sides until you have the length of beading that you decided on in the very beginning of this project. 4) After you've threaded on the last czech bead, make an overhand knot to secure the nymo thread, and place a small dab of glue on the knot to secure it. Make an overhand knot with the leather cording and length of nymo - pull this knot very tight without causing the czech beads to become congested and buckle up on one another. Put a small dab of glue on the nymo thread where is enters and exits the overhand knot. Thread the twist bead onto each length of leather cording and put an overhand knot in each of the cords about 1" from the other overhand knot. Cut off the excess leather cording after pulling each of the smaller overhand knots on each of the cords tight. 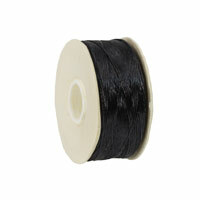 Don't cut the tails too short however, leave a little extra so that the cording doesn't back out of the knot. (You can also put a dab of glue on the knot, but be very careful not to use so much that the glue is very visible. Trim off the excess nymo cording on both sides of the bracelet and you're done.